THE sight of Padraig Harrington disappearing into the huge swathes of gorse to the right of the first fairway did not augur well for an Irish charge up the leaderboard in round three of the $7million (€6.14million) Dubai Duty Free Irish Open at sun-splashed Portstewart yesterday. He had chosen a 2-wood with a twelve degree face for the task of bombing his ball down the fairway. Instead, the Dubliner carved it right, and into the jungle high above the hallowed ground that was the verdant fairway. Credit to him. He had the landing place in his sights, and Harrington duly waded into the bushes, taking the nettle stings and everything else that goes prickly gorse. And credit, too, to playing partner Dean Burmeister of South Africa. Burmeister’s ball was safely in the fairway, about 100 yards up from Harrington’s chosen spot for a penalty drop in the rough. The South African offered to give the Irishman a line of sight to safety, but it meant climbing through the undergrowth, fighting his way to the top of the hill where he showed Harrington the line. He then had to scramble back down to his own ball, leaving Harrington to hit a decent shot which landed his ball in light rough, about 130 yards from the green. From there he pitched on to lie four, and then gave the galleries a thrill when he holed out from 40 feet. If there ever was a ‘good’ bogey, this was it. Unfortunately for Harrington, the round subsequently evolved into a game of snakes and ladders, which was pretty much the theme for all five Irish players who had survived the halfway cut. He closed on 71 for a one shot improvement on his starting score, to eight-under par. “To be level par through nine was a magnificent level par. “I was all over the place on the front nine, but the back nine I had chances all the way home, good chances. “I'm a little bit disappointed with one-under at the end of the day,” said Harrington. The three-time major champion goes into round four today as the leading Irishman at -8. Behind him are Michael Hoey (70) and Shane Lowry (71) on six-under par. Paul Dunne came back from -8 after 36 holes, to join Hoey and Lowry at six-under par after a disappointing 74. Challenge Tour player Gavin Moynihan carded a 73 for five-under par overall. Today is all about personal pride and trying to finish strongly, although that will be difficult given the weather forecast for torrential rain and cold, blustery conditions. Lowry played alongside Australian Scott Hend, who shot 64. The highlight of his round was his hat trick of birdies on holes five through seven, but bogeys on nine and ten took the wind out of his sails, and a double-bogey seven at the par-5 13th was another hammer blow. “I was going along nicely until the ninth hole, and for some reason, I just hit my second shot too quick. I though the pin was shorter on the green. I thought I had more behind the flag and tried to get up to the flag and I did, but I hit it over the green and made bogey. From there I was struggling,” said Lowry. Paul Dunne was quite candid about his 74 and his game. “My short game was as bad as I can ever remember it being today. “Any chance I had to kind of get things back on the right track, I didn't take them. “Just one of those days, I got nothing going. Kind of on the back foot from the start. Yeah, just a bit of a struggle, but I’ll try and regroup and do better tomorrow,” he said. Shane Lowry was asked how he felt about his 71. “Not great to be honest. It was easy out there. “I had everything from a two to a seven on the card. I hit a great putt on eight to get to nine under, and I missed that. “Then I missed the green from 90 yards on the ninth, made bogey there, and that was kind of the end of it. That was my momentum gone. I managed to play well at the end, but the middle of the round was disappointing. One eye on the Open? My game is good. I kind of let it slip in the middle of the round. “I feel like I have been playing ok.
“I think we are in for a bad forecast tomorrow, so at least if I shoot a good score tomorrow, I can jump some way up the leaderboard,” said Lowry. Perhaps it might be an idea for a sub-sponsor to put up a prize for the leading Irishman at the Irish Open. A handsome cheque and a trophy would provide some added incentive and bragging rights between the home players if they’re not in contention for the title. 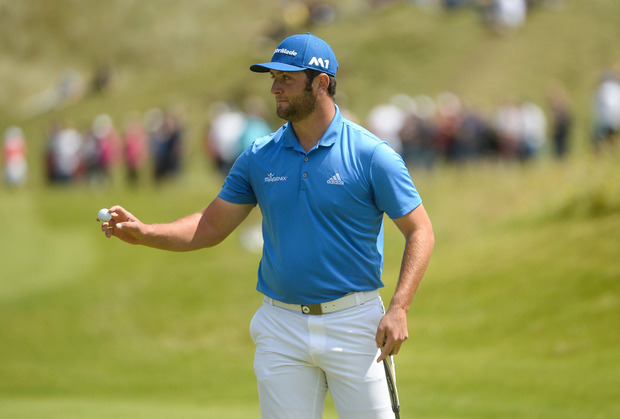 Meanwhile, the championship is set for a tense final round tomorrow with American Daniel Im and rising Spanish star Jon Rahm bracketed together on -17 after rounds of 68, 67 respectively. Eleven players are within five shots off the lead, so anything can happen, particularly with the heavy rain forecast.